Buckle up, I’m about to annoy a lot of die-hard fans: I thought this book was a disaster. I was so disappointed, because I’d been looking forward to reading this book for so long. My sweet husband gave it to me the day it released. I smiled, opened the book and was treated to 912 pages of blah. Don’t get me wrong, it wasn’t all bad. But the good was overshadowed by how bad the bad was. Let me start by saying that my lack of enjoyment in this book is at least partly my fault: I am one of the few people who don’t read these books for the romance, so the fact that this installment had so much of that in it didn’t interest me. That’s a point against me, not the writing. *Pro: The family these books follow (the Blackthorns) have varied, unique personalities, all of which are interesting in their own way. Ty, in particular, is my favorite. *Con: The cast of characters seemed almost too big for Cassandra Clare to write well, and they all began to blur into fuzzy pictures of their previous selves. 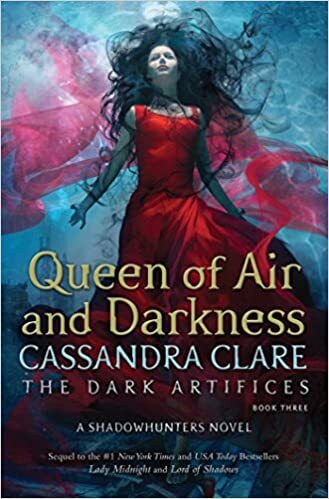 It felt as though she’d lost confidence in her ability to write these characters well, instead choosing to shoehorn in characters from the Mortal Instruments. *Pro: The demons in this book, as in all of them, are unlike any I’ve read elsewhere in description. Ms. Clare is also skilled at describing battle scenes that make them easy to picture in my mind. *Con: There was much more time spent on who should be in love with who, instead of the battle scenes I enjoy. Also, certain constants from throughout the other books seemed to ebb and flow, an example of that being the naming of the seraph blades. Sometimes they were named, sometimes not. *Pro: The Fae are done very well, borrowing from classic faery tropes, while having an original spin on them. The Unseelie vs. Seelie drama brewing had the potential to turn into something truly exciting. Despite what I see as an excruciatingly bad book, I’m still planning to read Cassandra Clare’s next book. That’s the thing. A misstep doesn’t necessarily become a deal breaker for me, as far as reading more by a certain author. I’m just going to go into it with more caution, and less excitement. I enjoyed QOAAD, but I agree with all of your cons. Way too many POVs in this book. This didn’t feel like a TDA book. I wrote my spoiler thoughts on my blog the book overall. GREAT post! The Ty and Kit storyline was so so sad.